If anyone thought we would quietly slip into the Fall season, you were so wrong! BELINDA METZ swept into the boardroom on a gust that rustled the trees and kept them stirring on August 31. We had a great turn-out, which concluded with enthusiastic chatter and exchange of coordinates. BELINDA began by sharing her incredible story of finding her way from dance and singing as a young teenager to master-mining her own launch into voice-over and commercial advertising in Toronto, in the early days of her professional career. With a strong emphasis on professionalism and ‘getting the job done’ no matter what personalities one is working with, her catch phrase for anyone in doubt was, “If you are passionate: Pursue it!” She shared ideas such as the importance of finding one’s niche and developing range from a place of authenticity while emphasizing both the creative drive and the ‘work’ required to deliver a quality product. 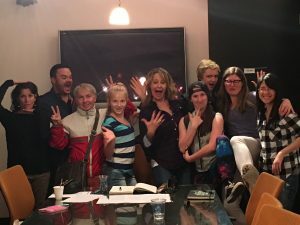 Always generous with her energy and enthusiasm for both her own projects and the creative dreams in the hearts and souls of those around her, we are fairly certain Belinda would have kept going into the wee hours of the morning, had we encouraged a sleep-over! That said, we were all out the door by 10:00pm and additional thoughts and ideas flooded my inbox come morning. Thank you, Belinda, for bringing to life in a very real way the true purpose of these gatherings – a chance to share creative thoughts/ideas, ‘tricks of the trade,’ energy, momentum and, most of all, a sense of community in this crazy niche in the entertainment industry! Belinda Metz is an Actor, Singer-Songwriter, Voice Artist who thrives on inspiring her peers and colleagues to achieve their best work through collaboration and mentorship. Belinda’s career began to take shape from the moment she rolled her love of storytelling into the pursuit of vigorous dance training and began winning awards in her mid to late teens. At 19yrs, she released her first record album and launched a concert-touring career through the transition into her twenties. Belinda has astounded thousands with her forward momentum. A powerful advocate for the theory that resourcefulness will get one far, she used her ear for picking up dialects to edge her way into film and television and, eventually, the commercial world. Enraptured with the art of advertising through her on-camera experience, it occurred to this powerhouse there was another avenue through which she could use her voice to create art and tell another brand of stories. Since producing and writing her first commercial demo reel and barging through the doors of Characters’ Toronto offices, Belinda has recorded voice-over for clients such as Molsons, Coca Cola, Stouffers Lean Cuisine, Finesse, Secret, Tide, Presidents Choice, Folger’s, Japan Camera, Levi’s and Mastercard to name a selection. She has voiced numerous corporate and documentary scripts including an ongoing contract for Telus’ IVR and the riveting program, “100 Years of Sports in Canada”. Animation credits include “X-Men” and “Clash of the Titans”.